Fetaque (pronounced FEE-TAKE) Sanders is one of the "greats" in magic. 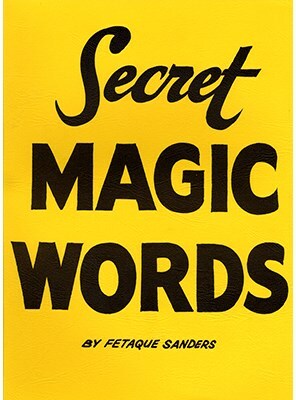 The "Secret Magic Words Book" has been used and tested for many years and tons of audiences. The book is used at any spot in your program when you are going to do anything magical. You say you have forgotten the magic words and proceed to take out the book! You show your audience it says "Secret Magic Words" (huge 12 x 9 cover) and you "look up" for the words you need to perform your magic trick! The "book" comes with instructions printed right inside the cover. Includes ideas and tips on how to use this versatile prop from one liners to placing reminders right in the pages! To vanish milk: "Let's see, yes, the words are, KITTY, HERE KITTY KITTY!" To produce handkerchiefs: "THE WISE OLD MAN SAID THAT, BEFORE WE CAME TO BLOWS, I SHOULD DO SOMETHING ABOUT MY NOSE!" To vanish money: "MARY, MARY, MARY! You see, Mary is my wife's name, and she's great at making money disappear!" Arm chopper: "If this fails. We'll just send you home in two taxis!" Paste your program right in the pages. Paste the names of important members of your audience. Use it as your "magic wand"
Roll it into a tube for production tricks. Use it for notes in one ahead tricks.